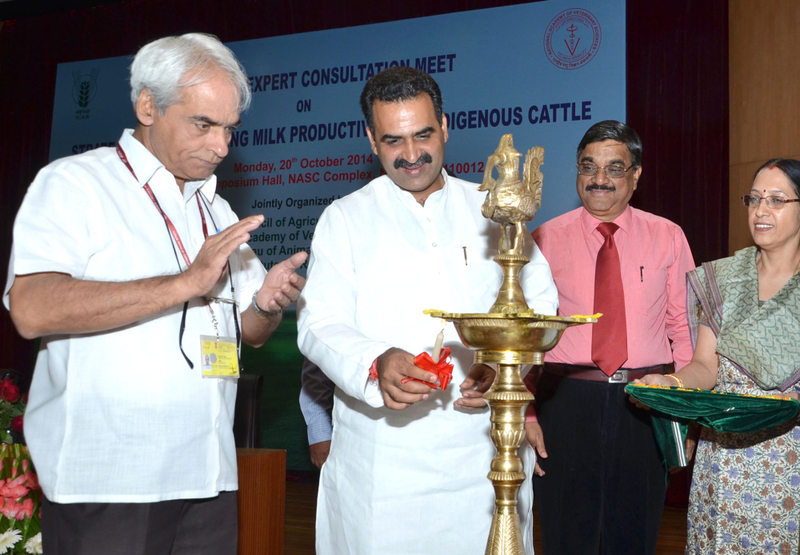 New Delhi: Union Minister of State for Agriculture and Food Processing Industries Dr. Sanjeev Balyan asserted that the indigenous breed of cow being disease resistant and tolerant to tropical weather conditions as compared to cross-bred cow has great potential to increase the income of farming community. Minister was speaking at the one-day ‘ICAR-NAVS Expert Consultation Meet on Strategies for Enhancing Milk Productivity of Indigenous Cattle,’ here today. He further added that the present Government has launched the Rashtriya Gokul Mission for improvement of indigenous cattle. Dr Balyan hoped that the project will yield rich dividends. He said, the Mission aims to conserve and develop indigenous breeds in a focused and scientific manner, for which breeding facilities will be set up for breeds with high genetic potential. On the occasion, the Honorary Fellowship of National Academy of Veterinary Sciences was conferred on Dr Balyan by President of the Academy. Dr Balyan has contributed significantly in the area of agriculture sector in general and livestock in particular. One-day interactive Consultation Meet of experts and other stakeholders was jointly organized by Indian Council of Agricultural Research (ICAR) through National Bureau of Animal Genetic Resources (NBAGR), Karnal; Central Institute for Research on Cattle (CIRC), Meerut and National Academy of Veterinary Sciences (NAVS). A.S. Thakur, Secretary, Department of Animal Husbandry, Dairying & Fisheries, Government of India, in his address, briefed on various initiatives taken by the Government for improvement of milk productivity and conservation of indigenous cattle germplasm.